An entry in the Encyclopedia of Arkansas History & Culture. In 2002, the Butler Center for Arkansas Studies at the Central Arkansas Library System in Little Rock embarked on a project to develop a digital Encyclopedia of Arkansas History and Culture that would be free and accessible via the Web. With support from several foundations and state agencies, curators Tom Dillard and Tim Nutt gathered an editorial board to plan the Encyclopedia’s development and populate it with offerings. From the beginning, the Encyclopedia intended to include articles about the state’s archeological sites, Native Tribes and Nations, prehistoric cultures, and the archeologists whose work contributed to this part of Arkansas history. State Archeologist Ann Early was a member of the founding board, and many of the Survey’s archeologists have contributed articles and reviewed hundreds of manuscripts throughout the last 15 years. The Encyclopedia debuted in May 2006 with 700 articles. Today the number has topped 5000, and the web site has been visited 1.6 million times. Arkansas Archeological Survey archeologists have written dozens of articles about Arkansas prehistory and early history, Tribes who resided in Arkansas and those who passed through during their removal to Indian Territory, important archeological sites, different periods in Arkansas prehistory, notable monuments and places such as Indian mounds, saltmaking sites, and rock art sites, and professional and amateur archeologists who contributed to public understanding of Arkansas’s deep past. The Encyclopedia’s global audience helps tell those stories to Arkansans as well as to a national and international audience. The long-awaited Volume 14 (Southeast, edited by Raymond D. Fogelson) of the Handbook of the North American Indians was published in 2004 (Smithsonian Institution, Washington, DC). Ann Early, Martha Rolingson, and Robert Mainfort wrote chapters discussing the prehistory of different regions in the Southeast after 500 BC, while George Sabo and Marvin Jeter contributed chapters about the Caddo and other Southeastern Indian tribes in more recent centuries. 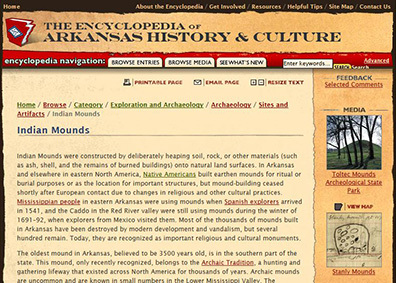 The 2009 Archaeology in America encyclopedia includes entries about Arkansas written by Survey archeologists. 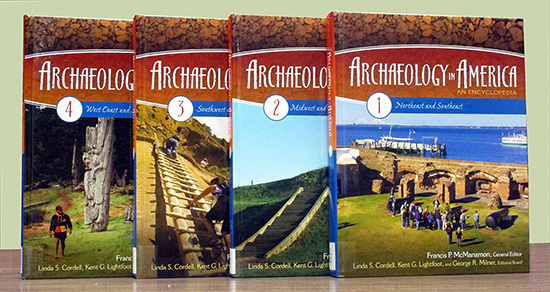 Several ARAS archeologists were asked to contribute short pieces to Archaeology in America: An Encyclopedia, edited by Francis P. McManamon and published in 2009 (Greenwood Press, Westport, Connecticut). Ann Early, Jeff Mitchem, and Martha Rolingson wrote entries about the Arkansas Post National Memorial, Parkin Archeological State Park, and Toltec Mounds Archeological State Park. Julie Morrow wrote entries about Paleoindian sites in the Northeast and the Southeast, and Mary Beth Trubitt contributed one about Mississippian chiefdoms in the Midwest. Jeff Mitchem, Julie Morrow, Mary Kwas, and Robert Mainfort wrote entries about sites in Florida, Missouri, Tennessee, and Mississippi. That same year, Jamie Brandon wrote an article on race and class for The International Handbook of Historical Archaeology, edited by Teresita Majewski and David Gaimster (Springer Press, New York). Arkansas Archeological Survey archeologists bring Arkansas’s history to a national and international audience.